Kids' Book Review: Review: What Will I Do When I Grow Up? 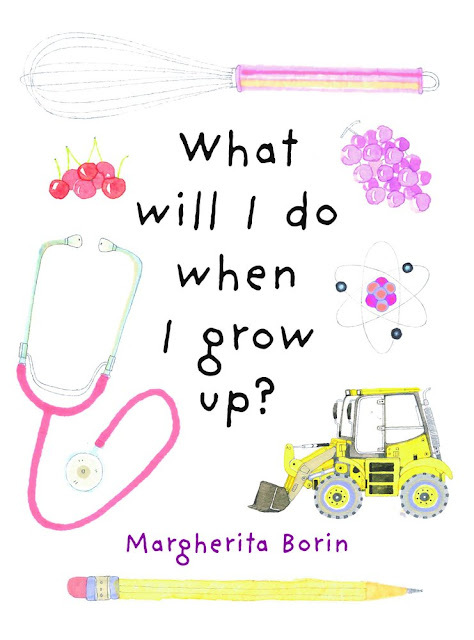 Review: What Will I Do When I Grow Up? What will I do when I grow up? It's a question children love to ponder — and the answer can change by the week. This week, my five-year-old is dreaming of becoming a duck farmer and a botanist. In this vibrant and contemporary book, Italian artist Margherita Borin takes a walk down the High Street of a town (or Main Street, as we call it in Australia) to visit five different people doing five very different jobs. There's a chef, a builder, a scientist, a teacher and an artist. Through contemporary and colourful watercolour illustrations, Borin details the different materials and tools that each job requires. The pretty street is one we'd all love to visit and there is so much for children to discover on each page. Be sure to check out the stunning endpapers and charming street scenes at the start and end of the book. The sparse text is equally colourful and invites children to explore the diversity of these vocations, also asking if this is what they would like to do when they grow up. This is a book to ignite imaginations and there is plenty of scope for discussion about the different jobs in the world, along with what it takes to prepare meals in restaurants, or build houses, or create a masterpiece. Title: What Will I Do When I Grow Up?